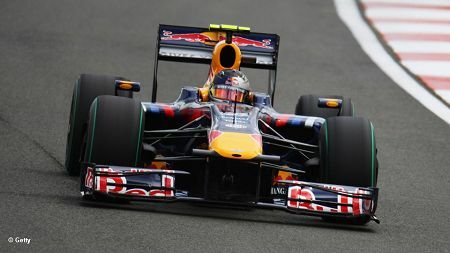 The Red Bull RB5, complete with ugly duck-billed new nose, continued to prove itself the best car in qualfying at Silverstone today. Rubens Barrichello managed to insert his Brawn BGP 001 in between Sebastian Vettel and Mark Webber but this was largely because Mark's final flier in Q3 was compromised by Kimi Raikkonen's less than ideal placing of his slowing Ferrari ahead of the Red Bull. Whether Mark would have displaced Sebastian from pole otherwise is debatable but he would certainly have grabbed second from Rubens. And now we have the long wait until the fuel weights are announced to see who was genuinely quick and who was faking it with a light load. As in Turkey, I do not think there are any outrageous differences between the strategies of the top ten this time, although one would expect the faster team mate to have a slightly car. So Vettel may be due for a pit stop a lap or two ahead of Webber and the same probably goes for Barrichello and Button. That would be the usual arrangement anyway. Jenson seemed less at ease on this circuit than his team mate all the way through practice and qualifying; even so, it may be a bit disheartening for him to have been pipped by Trulli and Nakajima, resulting in a sixth place for the Briton, his lowest grid position this season. Unless the fuel weights show him to be capable of running a longer first stint than those ahead, he will find it difficult to get his first British GP win. The Toyota has looked very handy all weekend and so it was no great surprise to see Jarno Trulli in fourth position - the old warrior has not lost the knack of qualifying yet! Expect Glock to be on a considerably heavier fuel load, however, as reflected in his eighth fastest time. And so to my boy, Kazuki Nakajima. It seems Sir Frank has been reading my blog for the team must surely have taken my advice in putting Kaz on the same strategy as Nico this time out. Either that or the guy loves Silverstone and knows it well; fifth is his best grid position to date and he was a good three tenths quicker than Rosberg. I will not say "I told you so" until the weights are announced, however. Both Rosberg and Alonso were mighty in getting into Q3 at all and are probably fueled heavy for a longer stint than others in the top ten. Massa was unlucky to just miss the cut, a mistake in his last lap in Q2 leaving him in eleventh. Kubica did a better job than Heidfeld in the evil BMW this time and was duly rewarded with 12th, with Nick unable to go beyond the last Q2 position of 15th. Kovalainen also did well to haul the wayward McLaren up to 13th and, of course, Hamilton had his hopes of making it beyond Q1 ruined by Sutil's accident as everyone was making their final runs. The session was halted with 24 seconds to go and the order stood - Lewis down in 19th. It is territory he is becoming used to this season and for which he was ably prepared by the stewards' penalties of last year. It looks as though Red Bull is going to win a dry GP at last, with just Barrichello being a serious threat. Certainly the Brawn is the only car that can threaten the RB5 tomorrow and Button probably has too much to do from sixth to be able to spring a surprise. Having said which, I would not put anything past the master stretegist, Brawn himself - if anyone can fiddle a win for Jenson here, it is Ross. The fuel loads could mess with that assessment, of course, and, if there any major surprises in the list, I will do an update to this post later. Hmmm. Vettel heaviest of the top ten. Things are looking promising provided he stays ahead of Barrichello and Webber off the line. Well done Seb! According to autosport.com Vettel is the heaviest with 666,5 kg of the first 10 cars on the grid. I am surprised and checked also with formula1.com to get it confirmed. I am bit impressed by Vettel. Agreed that Vettel's performance on the heaviest fuel load of the top five is pretty impressive. The race really ought to be his now. I was a bit disappointed to see that Nakajima is lighter than Rosberg although not by much. It does explain his speed to some extent but at least it shows that Williams are now trying to get both cars into the points. Surprised by how light Raikkonen and Alonso are; their cars are not good, that's for sure!